This weekend, we went to a presidential-themed dinner in honor of Lincoln’s birthday, Washington’s birthday (aka MY birthday), President’s Day and so and so forth. Most of the dishes were White House recipes or former presidents’ personal family recipes– it’s amazing what you can find on the interwebs. Our British friends even made the queen’s favorite pie (so clever, haha). I was in charge of the salad course and, after deciding that presidents don’t have particularly good taste in salads, I took the patriotic route and went with red, white and blue! The red was a no-brainer. 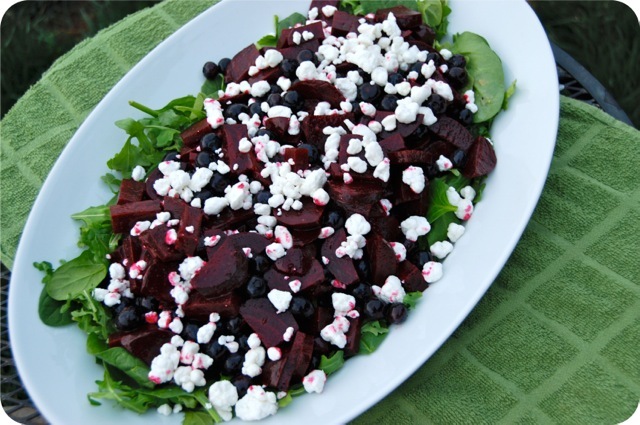 We’ve been OBSESSED with beets lately, and seem to eat them at least a couple times a week. We usually pair them with goat cheese or feta, so that took care of the white. The blue was a little tricky. Surprisingly few foods are naturally blue. So in the end, we went with the only one we could think of– blueberries! And it turns out that they pair very nicely with the sweet, earthy beets and tangy cheese. 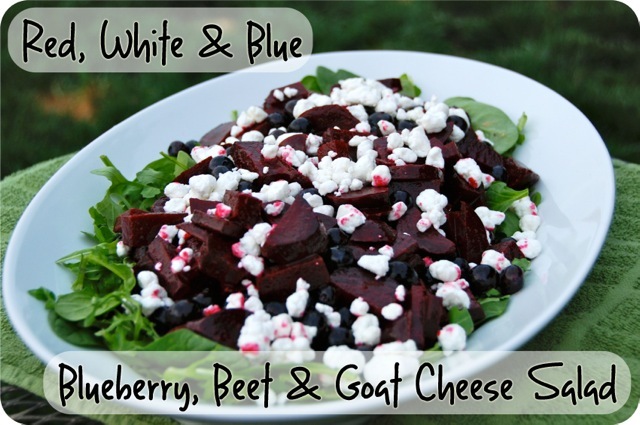 I decided to serve the salad over a bed of greens for a little more variety, but I would be perfectly happy eating just the red, white & bluebs! Wrap the beets individually in aluminum foil. Place in oven and roast for 1 hour. While the beets are roasting, combine all the dressing ingredients together in a small jar. Shake until well combined. Refrigerate to let the flavors develop. Unwrap the beets and let cool enough to handle. Carefully rub the beets with hands or paper towels to remove skins. Slice the beets into matchsticks. The salad turned out awesome and everyone loved it. It’s always a gamble serving something like beets to a crowd– though I don’t know why anyone would hate them since they are DELICIOUS. Last time this group was together, we started the meal a homemade pate so I figured I was safe with 8 adventurous palettes. It was a hit! In my limited beet experience, I think the temperature is key. I’ve been served them before where they were lukewarm and kind of thick cut. It was just…weird. I think I like the taste; I just couldn’t get behind that preparation. This salad looks deelish though.